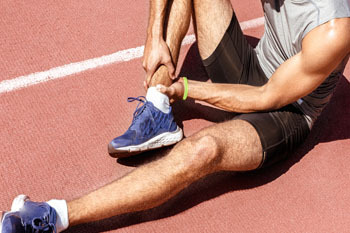 Foot and ankle injuries are common among people who participate in sports. Several factors contribute to this. They include failing to stretch or warm up properly, not wearing the proper type of shoe and not taping or providing other types of support for the ankle or foot. The most common foot and ankle injuries suffered by people involved in sport are plantar fasciitis, ankle sprains and Achilles tendon damage or ruptures. If not treated properly they can lead to permanent disability. Plantar fasciitis is a painful condition. It is inflammation of the plantar fascia, the thick fibrous band of tissue running from the heel to the base of the toes. There are several effective treatments for this ailment. Doctors often proscribe rest, massages, stretching, night splints, physical therapy, anti-inflammatory medication, corticosteroids or surgery usually in that order. The most effective treatment for plantar fasciitis is orthotics, such as foot supports. Surgery is occasionally used as a last resort. The Achilles tendon is the largest tendon in the body. It connects the calf muscles to the heel bone. Running, jumping and walking all impact this tendon. Two common injuries to the Achilles tendon are tendonitis and a rupture of the tendon. Tendonitis is inflammation in the tendon often caused by an increase in the amount and intensity of stress placed on it. It can either be treated non-surgically with rest, ice or anti-inflammatory medication or surgery may be required. A rupture (tear) of the Achilles tendon can be treated by placing the lower leg in a cast for several weeks or with surgery. Many physicians feel surgery is the better option because it lowers the risk of re-ruptures. Both methods require 4 to 6 months of rehabilitation. Treating these injuries is relatively simple if they are identified and addressed early. Many athletes dismiss the initial aches and pains associated with injury as just soreness or tired muscles. Their first response is usually to try to work through it. This can lead to serious problems. Many minor injuries are made far more serious when athletes continue to put strain and pressure on them. That attitude can change a mild strain into a serious strain and a minor tear into a rupture. Athletes should have unusual aches and pains evaluated by a skilled, licensed medical professional.